Abstract: Power-electronics engineers designing switched mode power supplies (SMPS) are faced with the challenges of limited space, the need to meet worldwide energy regulations, and ease of design. Dual switch QR flyback topology and secondary synchronous rectification is the ideal solution to meet future energey regulation - providing good overall efficiency, managing low power loss at light load, while providing ease of design. The validity of the proposed topology is verified with a 90W prototype power supply. Introduction: Because of the increasing concern for the environmental issues, the design of power supplies for high efficiency and low standby power consumption keeps gaining attention in these years. Soft-switching or resonant conversion topologies are utilized in recent years to meet high efficiency challenge. However, future challenge for low power consumption, low cost, easy design and manufacturing poses a huge challenge to current resonant topologies. The purpose of this article is to illustrate the operation theory and benefit of a new proposed topology: two-switch quasi-resonant (QR) flyback converter and demonstrate a 90W power design which fulfills the requirement of high-efficiency (> 90%) and slim form factor ( 60mm x 95 mm x 16.5mm) while meeting 2013 ErP power saving request ( <0.5W under 0.25W load). Given the benefit provided by dual switch flyback, it could be a potential solution to meet the future demand of notebook AC/DC adaptors, LED TV power supply, LED lighting drivers, all in one PC powers and high power charger and any such SMPS power supply designs. I. Power Saving : Meet 2013 ErP power saving request: < 0.5W @ 0.25W load. II. 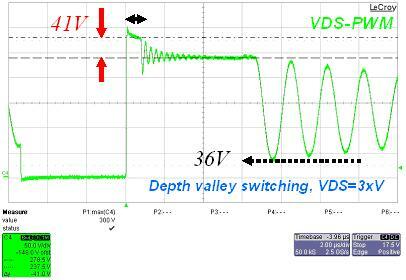 Excellent light load efficiency by deep extended valley switching. 3. Power switching voltage be clamped to VIN and could use < 500V MOSFET. 4. No snubber circuit and loss, less heat problem. 5. Good for slim form factor design by allowing slim transformer and high frequency design. 6. Easy to design and manufacture. The operation theory and solution benefit are explained in below paragraphs. In PFC stage, it uses a CRM PFC to boost output into PWM stage. In a power ranges less than 200 watt, a CRM PFC is preferred due to its merit of zero current switching and zero diode reverse recovery loss. Also, the FAN6920 has a feature of two PFC output levels which allow a lower PFC output during low AC input to improve low line efficiency. In PWM stage, there are two power switches to control energy delivery timing, their turn-on/off timing are in same sequence, the control signals are sent from PFC/PWM combo controller  . Combining with two recycling diodes that can clamp the maximum voltage rating of PWM switches, It also recycles the leakage inductance energy to gain more system efficiency. By doing so, primary snubber can be removed to simplify circuit and save system cost. 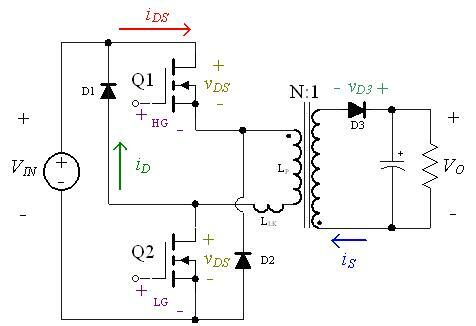 Furthermore, this stage operates in quasi-resonant mode; it also could keep PWM switches turning-on with minimum level of drain-source voltage, which could save lots of switching losses in PWM stage. 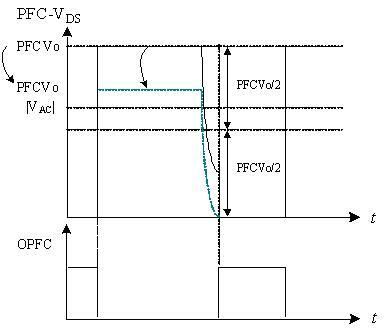 Moreover, this topology could allow wide input voltage (PFC output voltage) range, therefore, by adjusting PFC output voltage that could benefit PFC stage efficiency improving. In rectification stage, there is one rectifier diode is used to conduct and rectify output current, and then generate a DC output voltage to load. However, forward-voltage drop of rectifier diode is generated while the rectifier diode is forced to turn on, because this voltage drop generates rectification loss and causes overall efficiency suffered severely. To further reduce and improve this loss and caused thermal issue, using a low turn-on-resistance (RDS-ON) MOSFET to be an active device - Synchronous Rectifier (SR) for rectifying is preferred to be chosen. The SR MOSFET could be driven and controlled through a SR controller (e.g. FAN6204 ). As mentioned previously, PFC stage operates in critical conduction mode, so that switching frequency would be changed from output load. With heavy load condition, the frequency becomes lower whereas becoming higher with light load condition. And therefore, switching loss of PFC switch becomes a key factor for overall system, especially in light load condition. Referring to Figure 2, when PFC switch turns off, the drain voltage of PFC switch raises and which is clamped to PFC output voltage until boost inductor current dries out. The behavior waveform when inductor current discharges to zero can also be seen in Figure 2, when drain voltage of PFC switch starts to resonate and decrease, and then when it reaches minimum level, PFC switch could be turned on by PFC controller then starts a new switching cycle again. If PFC output voltage is set to lower and input voltage is also at low level. If it can satisfy the following equation (1), the PFC switch could be turned on with much lower drain voltage or achieving ZVS. That could much better for PFC stage efficiency improving. 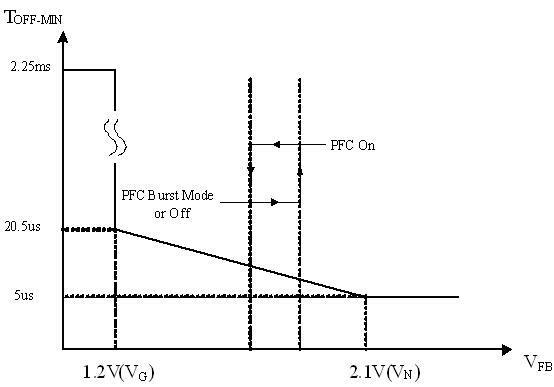 (1)With different PFC output voltage setting, we can obtain PFC stage efficiency result as shown in Figure 3. By setting lower output voltage, PFC stage can improve more switching efficiency during light load due to higher switching frequency. 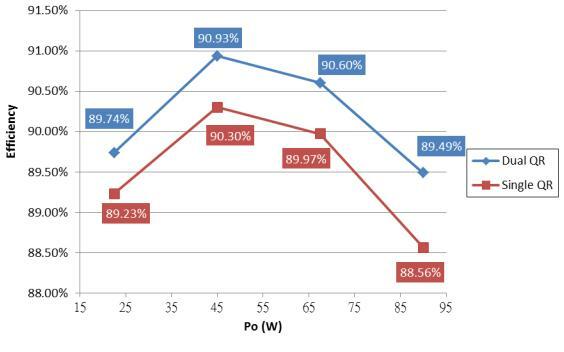 Also we can obviously see the results on 20W output power in Figure 3; there is around more than 4% efficiency improvement by decreasing PFC output voltage. Figure 3, PFC stage efficiency comparison at various PFC output voltages at 115VAC. Referring to Figure 4C, at the beginning of turn-off period, leakage inductance of transformer produces voltage spike on PWM switches, and causes drain voltages increase to VIN voltage and then clamped to this level. And therefore, the leakage inductance energy which was stored during PWM switches turning on could be released by two paths. 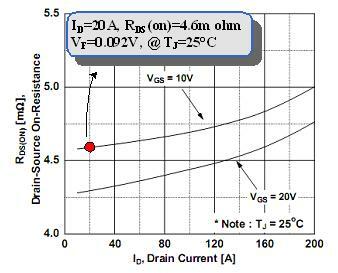 One is releasing to PWM drain-source capacitances to charge and increase drain voltage to VIN from the voltage (Refer to equation 2). And releasing and recycling to VIN through two recycling diodes D1 and D2. So that the transformer turn-ratio and VIN voltage level (PFC output voltage) would influence recycling period and percentage. To compare different turn-ratio and look how it would have influenced PWM stage. The following measured waveforms Figure 5 (A) and (B) show drain-source voltage of low-side PWM switch during different turn-ratio (N=11 and 12). There are several different system behaviors between Figure 5 (A) and (B). Setting higher turn-ratio it would obtain more depth valley switching, and it also could benefit on decreasing switching losses of PWM switches. Another point is recycling period would become longer with higher turn-ratio setting. It can be obviously seen its differences in measured waveforms. Higher turn-ratio setting, it could also recycle more leakage inductance energy rather than wasting energy on charging drain-source capacitances of PWM switches. 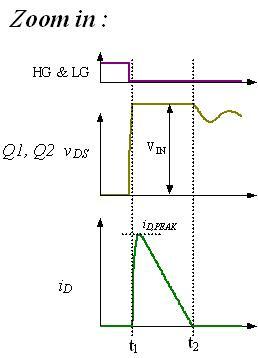 Figure 5 (C) shows recycled currents which flow through diodes D1 and D2 during different turn-ration setting. Another point of view, on secondary RMS current will become higher after increasing turn-ratio. 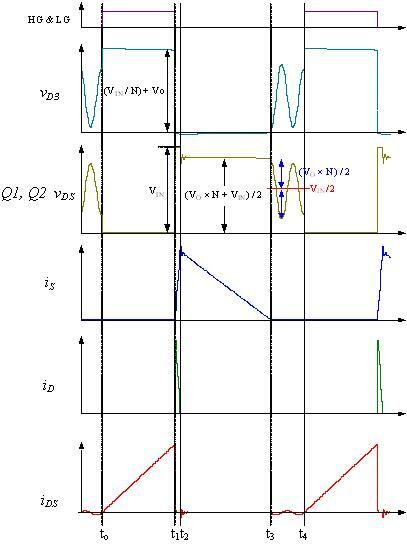 Based on various applications, It should to be considered and be optimized between PWM switching loss and rectification loss on secondary. 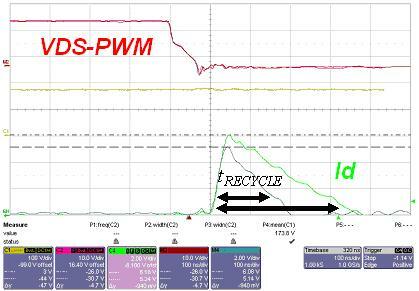 There is one limitation on using this PWM topology due to recycling diodes. During PWM switches turn off period, the voltage on primary winding is clamped to VIN. If the voltage of secondary winding is low than output voltage target (VIN/N < VO), the output voltage will drop and be clamped to VIN/N, and the most energy stored in transformer would be release to VIN during turn-off period. That could cause output voltage out of control until VIN voltage is charged to higher than N×VO. So that VLP voltage should be designed smaller than the VIN voltage (Not including voltage spike) during PWM switches turning-off period. 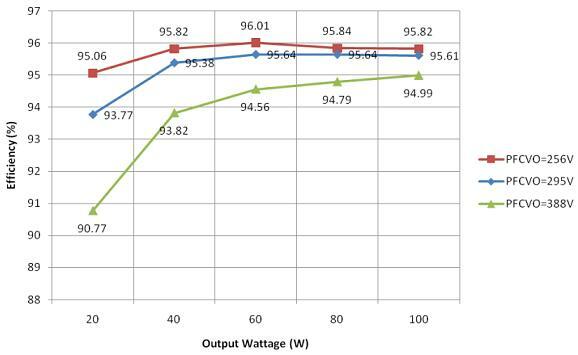 Figure 6 shows FAN6920's feedback voltage (VFB) versus minimum PWM turn-off time (TOFF-MIN) characteristic curve. During light load condition or output load decreasing, PWM turn-off time would be extended according to VFB voltage. That means the PWM switching frequency will be decreased. Furthermore, controller will let PFC stage operation at green mode to further reduce operating current and losses from PFC power device circuit. 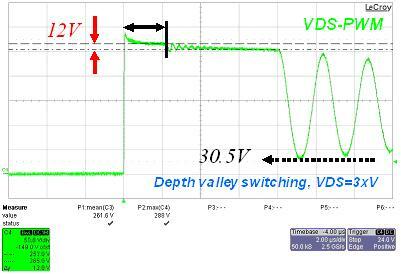 Moreover, PWM stage has still keep valley switching property to keep switching loss at minimum level. And therefore power system can get better efficiency during various output load (e.g. 25%, 50%, 75% load). 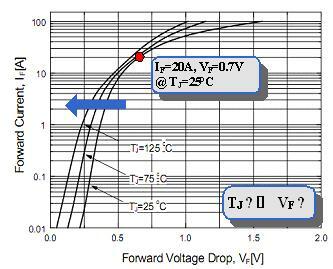 To compare the Schottky diode (FYP2006DN)  with the MOSFET (FDP5800) , under same conducted current level, around 0.6V difference forward voltage drop can be calculated and obtained (Refer to Figure 7 and 8). Worse yet, because forward voltage drop is depending on its conducting current, However, because rectifier diodes are passive component, it's very easy to implement on power system whereas SR needs to be triggered by additional timing driven circuit. 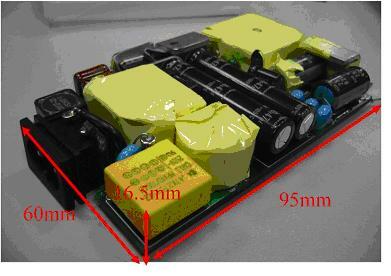 A 90W/19V SLIM Adaptor (Refer to Figure 10) has been done and verified its feasibility, and to show its performance. As shown in Table 2, with green mode operation, it can meet ENERGY STAR EPS version 2.0 no-load power consumption requirement, and achieve under 200mW input power. 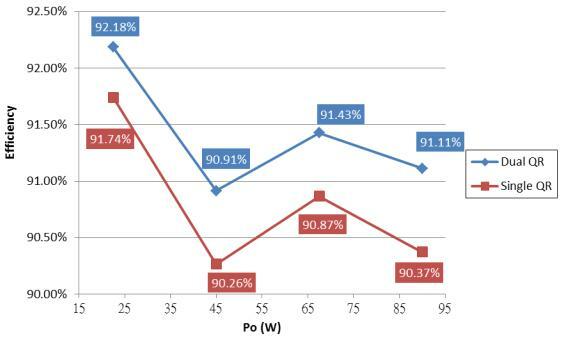 Furthermore, Figure 11 and 12 are shows the efficiency comparison between 90W dual-switch QR flyback and 90W single switch QR flyback, the efficiency of dual-switch QR flyback is higher than single switch flyback, with the average efficiency is more than 90% (including output cable). Figure 11, Efficiency comparison between dual-switch QR flyback and single switch QR flyback (90W/19V Slim Adaptor, including output cable AWG18-1.2m). Conclusion: Compared with single switch flyback, the efficiency of dual-switch flyback is better than single-switch flyback, low voltage stress at primary side switch, without snubber circuit. Compared with LLC topology, dual-switch flyback is easy to design and mass production, shorter design timing and higher efficiency at light load condition. Dual-switch switch QR flyback has low standby power consumption, can help total system to pass EuP 2.0 spec (standby power consumption <0.5W). So, the dual-switch QR flyback is an ideal solution for high efficiency and low profile power supply design such as AC/DC adaptor power supply used in notebooks. "FAN6920MR", Integrated Critical Mode PFC / Quasi-Resonant Current Mode PWM controller, Data Sheet, Fairchild semiconductor. "AN-6921", Integrated Critical Mode PFC / Quasi-Resonant Current Mode PWM controller, Application Note, Fairchild semiconductor. "FAN6204", Synchronous rectification controller for Flyback and Forward Freewheeling Rectification, Data Sheet, Fairchild semiconductor. "FYP2006DN", Schottky Barrier Rectifier, Data Sheet, Fairchild Semiconductor.